Up to 1 Month Free! Limited Time Only. Schedule a tour today. For a limited time only. Restrictions apply. Call to schedule a tour and see how you can get up to one month in FREE rent! 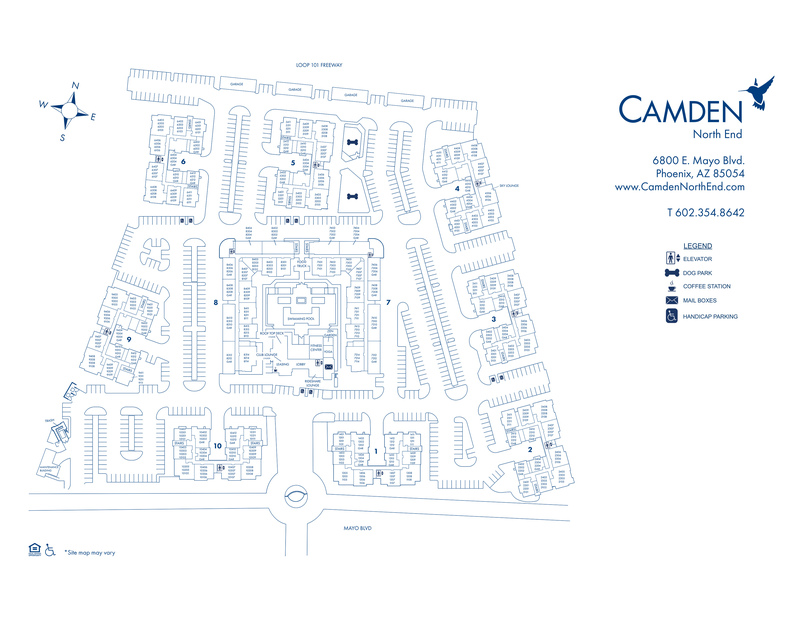 Camden North End apartments in Phoenix are now open just west of North Scottsdale. Choose from a variety of brand new, open-concept, studio, one, two and three bedroom luxury apartment homes that feature chef-inspired kitchens with quartz countertops, expansive islands, stainless steel appliances, under-cabinet lighting and tile backsplashes. Inside each apartment, you will also find wood-style flooring throughout, walk-in closets, and a full-size washer and dryer as well as pendant lighting and ceiling fans on 9'-15' ceilings! Want to see it for yourself? View the virtual tours of our floor plans! When you call Camden North End home, you will enjoy resort-style amenities, convenient access to neighborhood favorites and more. Let's start with the 24-hour fitness center with cardio and strength training equipment + free weights. And, just alongside it is a yoga and spin studio featuring on-demand, virtual training classes. Entertain your friends at the heated pool and spa with expansive sun deck, covered cabanas and outdoor gaming area. After the sun goes down relax by one of the many outdoor fire pits near the pool or on the rooftop sky lounge. Take advantage of the indoor/outdoor resident lounge with fan misters, an entertaining kitchen, billiards and BBQ grills. And enjoy an outdoor meal in our picturesque food truck dining area. When it is time to get down to work, head into the 24-hour eLounge with comfortable seating, gorgeous views and wireless printer/scanner. Our pet-friendly apartment community will soon include a pet wash area and two enclosed dog parks to create dedicated spaces for small and large dogs. Camden North End is also a non-smoking community so you and your guests can breathe easy and enjoy healthy living. Just down the road from the Mayo Clinic, an apartment home at Camden North End puts you within walking distance of thriving restaurants, shopping and a movie theater at The Scottsdale 101 Shopping Center as well as being just a short drive away from Whole Food Market and Life Time Fitness. With convenient access to the 101 Freeway, your commute will be a breeze. Want to leave the car and parking hassles behind? No worries, call your favorite ridesharing service and relax while you wait in our air-conditioned Rideshare Lounge. Exploring the great outdoors is now easier than ever. You will find the best hiking and biking in Arizona at the nearby Gateway and Tom's Thumb Trailheads at McDowell Mountains. Camden North End is truly surrounded by everything you could possibly need! One of these brand new North Scottsdale apartments could be yours and we would love to help you find your perfect home here. It's not just an apartment at Camden North End, it's a state of mind. At Camden, your pets are family too! We welcome cats and dogs, up to two pets per apartment with no weight restriction. We do not permit American Pit Bull Terrier, American Staffordshire Terrier, Staffordshire Bull Terrier, or any other dog or breed deemed aggressive. Each apartment home has one covered parking spot as well as street parking within the gates of our community. Guests are welcome as we offer plenty of free visitor parking as well. Garages, carports and extra storage available!